VIRGIL VAN DIJK will be fit to feature in Liverpool’s Premier League clash with Huddersfield Town on Saturday, according to Netherlands head coach Ronald Koeman. 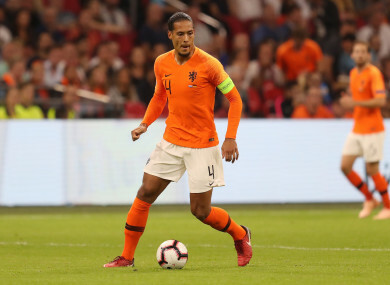 The Dutch captain was ruled out of tonight’s friendly with Belgium after their football association confirmed he was still suffering from a rib injury sustained in Liverpool’s meeting with Southampton last month. The 27-year-old played the full 90 minutes in Saturday’s Nations League win over Germany – scoring the opener in a 3-0 win – before returning to his club for further treatment. And, speaking to De Telegraaf, his international manager claimed: “Virgil has been playing with two broken ribs for weeks and has been constantly injecting to play at Liverpool in recent weeks. Email “Koeman claims Liverpool defender Van Dijk 'has been playing with two broken ribs for weeks'”. Feedback on “Koeman claims Liverpool defender Van Dijk 'has been playing with two broken ribs for weeks'”.